enjoy the beautiful sunsets. The fully equipped guest cabin can easily accommodate families or small groups. 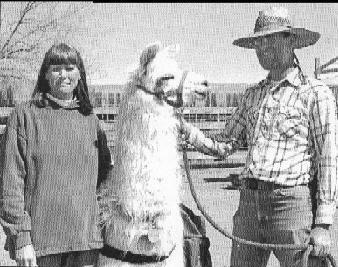 WTR is a working llama ranch. 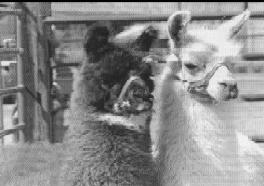 We have 26 llamas. WTR offers llama rentals and a horse motel. Peak, North Absaroka, and Washaki Wilderness areas are within access of WTR. The wild horses of McCullough Peaks, the Heart Mtn. Relocation Center, the Dinosaur Tracks or the Dinosaur Dig, the nightly Stampede Rodeo in Cody, the Big Horn Canyon National Recreation Area, and the Buffalo Bill Historical Center, are just a few activities within the realms of your vacation time while at the ranch. If you like aircraft you will enjoy seeing the Museum of Flight and Aerial Firefighting. The staff at WTR like to fly, and can accommodate those wishing to fly-in to stay at the ranch. Check out the Flying ??? page for area information. The other menagerie of the ranch are our Belgian draft horses to our expert mousers. We've had resident Great Horned Owls, and there have been numerous bald and golden eagles. We seem to have a birding mecca within the Basin area. WTR is located 3 miles east of Burlington, WY, on Lane 38. At the bar in Burlington turn east on the gravel road and proceed 3 miles. 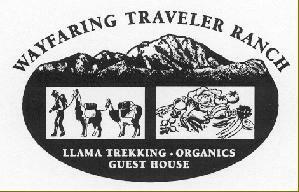 When you see a "Lama Drive" sign the Wayfaring Traveler Ranch entrance will be at the top of the hill on your right.